"Drawing" may be easy to define for most of us, but contemporary artists often delight in flouting limits. "Drawing the Line," the juried show that the Mills Gallery at the Boston Center for the Arts stages every other year, seems to draw no lines when it comes to this medium. Juror Maria Magdalena Campos-Pons, a Boston-based artist with an international reputation and a nervy aesthetic, has included textiles, installations, videos, and even a performance-oriented piece in the exhibition. Juried shows can be haphazard; this one, featuring work by 26 artists, hangs together well, and despite a few missteps, the work is generally engaging. But the inclusion of certain pieces - particularly a handful of videos - seems beyond cheeky. To me, drawing must include a gesture made by hand. A couple of animated videos may fall under the gestural umbrella, but A. Jacob Galle's "4.11.04 ice cutting," a grainy, black-and-white video of a guy chopping ice out of a frozen lake, doesn't cut it. Jennifer Schmidt's three-channel digital video installation "Tulipomania/Everquest" features a montage of photos of tulips and tulip motifs; occasionally, an emblem of the flower appears on all three screens, as if you've a hit the jackpot. This piece has nothing to do with drawing. I also question Cree Bruins's installation of black-and-white photos, mounted like piano keys on the wall, each depicting a notched strip of blank film. It's a clever, jazzy piece, but it's not a drawing. Matthew Cleary's poured-paint installation is eye-catching, but it's a painting. 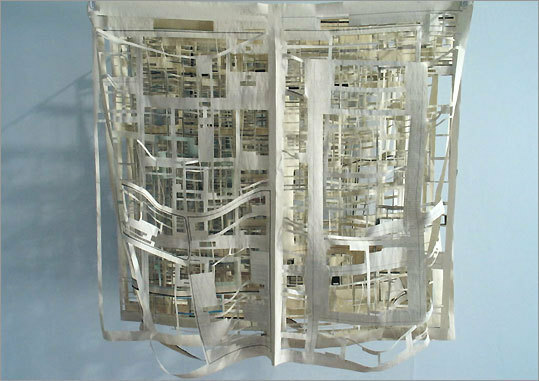 Nancy Murphy Spicer's "Hanging Drawings" does offer a fresh, interactive take on the oldest of mediums. She has mounted pins on the wall and invites viewers to drape a long, black rubbery string over them and make the work their own. Rosana Castrillo Diaz, who was invited rather than juried into the show, has a gorgeous untitled installation crafted from transparent tape, woven into a delicate web that balloons slightly from the wall, casting a terrific shadow. Mia Pearlman's installation "Nigh" looks like a vicious weather system swirling over one corner of the gallery in India ink on cut paper. Jenine Haard's lovely "Emergence" features wires tightly wrapped in red thread, bursting delicately from the wall like exposed blood vessels; farther up the wall, Haard leaves the thread off the whitish wires, suggesting a landscape's horizon line. With all this work along the edges of drawing, the more classic examples are tiny harbors of refuge. Lior Neiger's ink-on-paper "Drop, Drip" diptych marries the abstract exploration of his medium with the graphic splatter of a dropped bomb. Annie Heisey's charcoal drawing "Waterfall" is charged with emotion: A woman stands in the shower, holding her strong hands to her face, and wearing a child's water wing. In collage, the artist makes a gesture by cutting or crumpling the paper, rather than drawing on it. Gonzalo Fuenmayor's engaging "Technicolor Geographies" works are contained within plexiglass cases; each is framed in curving black paper that references a television screen. Within that, the artist has built fantastical and ominous skyscapes, with exploding blimps and billowing smoke clouds. Pat Shannon's reductive collages start with newspaper sections. The artist cuts out all the ads, text, and photos, leaving only gullies of newsprint running down and across the page. "Cape Cod Times" features that eviscerated paper hung on metal rods, one page behind the next. It reads, eerily, like an abandoned city, all three-dimensional grid and no populace. Despite strong works such as these, "Drawing the Line" doesn't measure up to the last drawing show at the BCA, which was stellar. Staged by then-curator Laura Donaldson two years ago, it featured very few artists, all doing wall drawings that really tangled with the issues of the medium. Sometimes you don't have to push at the limits to redefine a discipline - you just have to go more deeply into it. Two guys named Joe took over Allston Skirt Gallery while proprietors Randi Hopkins and Beth Kantrowitz were at the Miami art fairs earlier this month, and they turned the space into a comic, twisted laboratory for exploring identity, authorship, and performance. Artist and filmmaker Joe Gibbons has been in three Whitney biennials. Artist Joe Zane hasn't been around as long, but last year he had a crackerjack show at Allston Skirt along these same lines. Here, the two Joes offer a howlingly funny video based on a scene from "The Nutty Professor," in which Jerry Lewis, in a lab coat, makes a Dr. Jekyll-to-Mr.-Hyde transformation. Joe's video loop has Zane make that same transformation to Gibbons, and then Gibbons to Zane. Which is the real Joe? Is there one? A vessel full of prescription pill bottles for psychotropic drugs suggests that personality is malleable. The two Joes have also put together a fake edition of Parkett, the German scholarly art journal, featuring articles about "Joe." It's a parody, yes, but it raises provocative questions about who anoints the next big thing in art. "Joe" is zany, but beneath all the humor it has guts. blog Exhibitionist: Inside. Backstage. Behind the scene. At: Mills Gallery, Boston Center for the Arts, 539 Tremont St., through Jan. 6. 617-426-8835, bcaonline.org.